When my husband and I got married, we knew very little about each other’s finances. Money was such a taboo topic that when we finally did discuss money, I was shocked to learn about my husband’s credit card debt and he didn’t know I had so much student loan debt. Our inability to discuss money prior to marriage started us off on rocky financial ground that plagued our marriage for years to come. My husband is a spender, and I’m a saver. While the experts may agree that opposites attract, when it comes to finances, having such opposite viewpoints can cause financial strife. We worked hard to get to a point where we found financial balance. 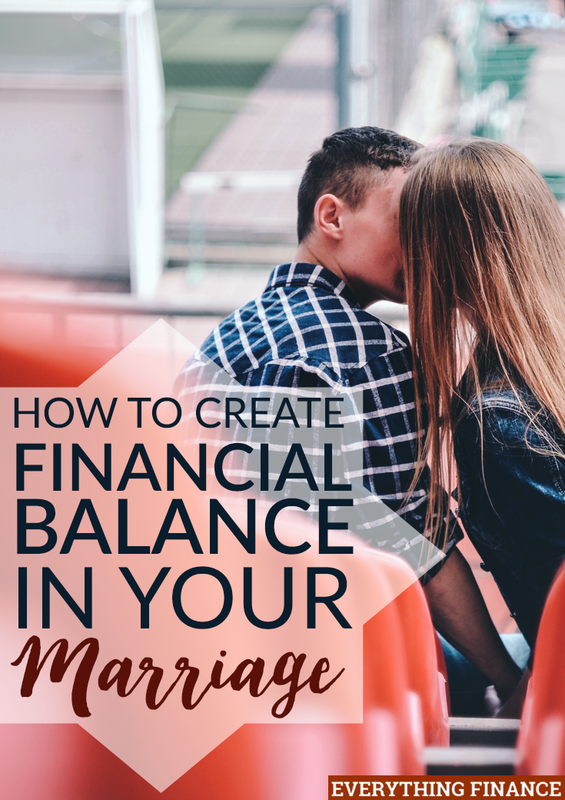 Here are three ways we created financial balance in our marriage, and how you can too. When it comes to money, it’s very easy to look at your paychecks as “yours and mine.” But this type of mindset can be detrimental to your long-term financial goals, as well as your view of your partnership. Keeping tabs of who’s bringing in how much can create marital discord if you’re trying to continually even out the scorecard. There are obviously times when you should be smart with you and your partner’s money. For example, if they have a gambling problem or refuse to contribute to the household, either financially or by being a homemaker, that’s understandably going to create friction. However, it’s important to differentiate these drastic examples from an everyday partnership where both couples are contributing. There’s no point in keeping score because you both play for the same team. To truly create financial balance, you have to be working toward the same financial goals. Do you want security in retirement? Do you want to travel the world? Would you like to be homeowners? All these things require some form of financial commitment and independence. You can’t create financial harmony in your marriage if you’re both working toward opposing money goals. If you share the same goals, but you prioritize them differently, try to compromise by contributing to both goals equally. What if he wants that second honeymoon to Maui and you want to get the full 401(K) match at work? You can work toward both goals. How often do you and your partner talk about money? It’s not enough to put your finances on autopilot. With major life events, financial priorities can change. And even week to week, there may be reasons to shift the budget. Check in with each other regularly to make sure you’re still on the same financial plan. It can be as little as 10-minute conversations every week to ensure that you’re still working toward the same goals and you both agree with how your money is being spent. How have you and your partner created financial balance within your relationship? Did you struggle to reach that point, or were you always open about money?